The Device naming tool (Tools > Provisioning > OS Provisioning) enables you to create unique device names using device-naming templates. 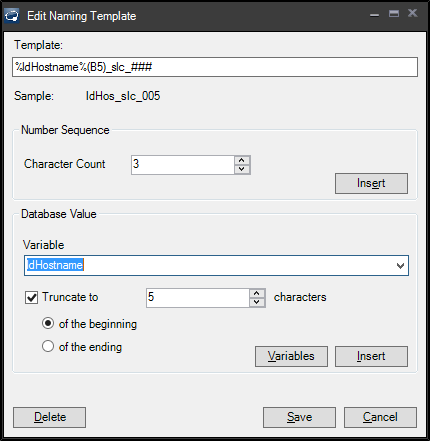 The naming template can use truncated core database values and a multi-character incrementing numeric sequence. You can create multiple templates and use the Device Name Prompter action to select the name template you want. Name length can't exceed 15 characters. The Template field shows the template you are building. Customize a variable or number sequence and click Insert to add that item to the Template field. You can also type custom elements or make other adjustments directly in the Template field. In the example above, the naming template uses the beginning 5 characters of the %ldHostname% value, with a hardcoded location of _slc_, followed by a 3-digit zero-padded number sequence that will increment automatically. The core server tracks the number used in each naming template and automatically increments that number (starting at 1) each time a device is named.